In observance of National Hospice Month, CHI Health at Home invites the community to the annual Hospice Flag Raising Ceremony on Thursday, November 1 at noon at the South Visitor Entrance of CHI St. Alexius Health. The ceremony consists of a short prayer service following the raising of the Hospice flag. 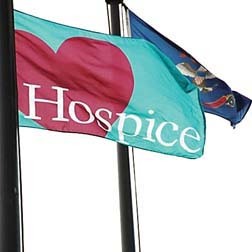 The flag serves as a reminder of the efforts of hospice clinical and support staff, volunteers, family caregivers, physicians, pharmacists, social workers and clergy who tend to the terminally ill with care and compassion. The flag will fly the entire month in remembrance of those who have died while receiving hospice care.